This entry was posted on March 14, 2012 by Sports Traveler. Holy cow folks! The First Four games last night provided the sports world with the best possible start to the NCAA tournament. When they first added the play-in game, I found it somewhat meaningless and never cared to watch two teams battle for the right to lose in the NCAA tournament. Even after the field was expanded to 68 teams in 2011 and thus a total of 4 play-in games..... Still didn't care too much. The talent level and potential for good games increased but I still assumed these were teams that were destined for a first round exit anyways. 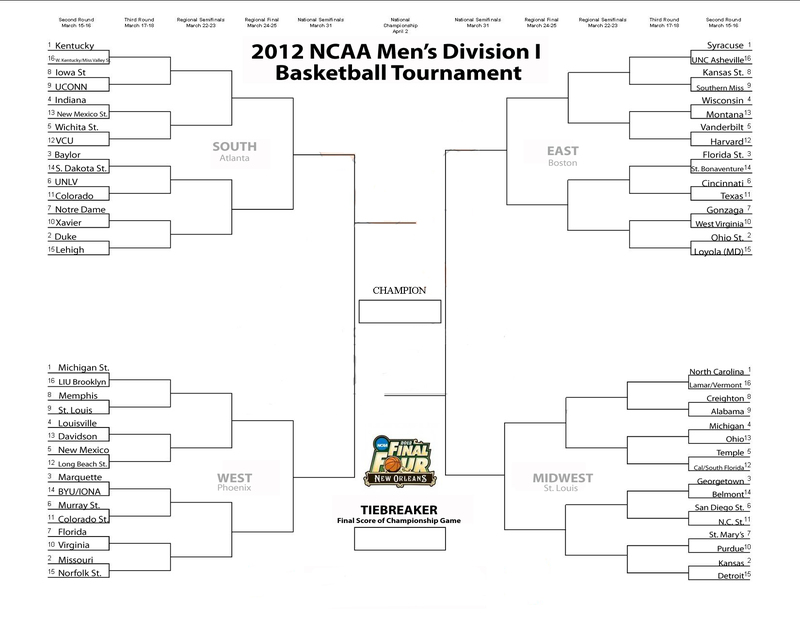 Plus most brackets don't have you fill out the play-in games so interest level is naturally limited. Fast forward to the conclusion of last year's tourney and one of those teams (VCU) made it to the Final Four. And naturally my interest dramatically increased this year when thinking about the success of the Rams last year. It could have just been a lucky run but when you win 5 games in the NCAA tournament it is clear that skill, preparation, and coaching played a much larger part than luck. Although I think any coach will tell you that luck is warmly welcomed at any time. Now fast forward to last night. With the excitement of the tournament seeping from my body I was actually looking forward to watching the First Four play the first two games of the 2012 NCAA tournament. Before the games began I had no expectations of what was to come. The only knowledge I had of the any of the 4 schools playing was that Jerry Rice was an alum of Mississippi Valley State, and that Jimmer Fredette, Steve Young, and many Mormons attended BYU. Needless to say it wasn't a lot. When the first game started I immediately began to question my interest level as I was already in the channel guide at the 18:40 mark of the first half. Lucky for me I committed to watching the games didn't change the channel for the rest of the night. Both games had moments where the game seemed to be over and a channel change was in order. Thankfully I reached the saturated portion of evening TV watching and my laziness kept me from attempting to find something else. Not to mention the NBA did not have any nationally televised games for those of us not subscribed to the League Pass. What ensued after the first 35 minutes of basketball was a perfect demonstration of why the first weekend of the NCAA tournament continues to be the most exciting weekend in sports. I could spend all day talking about all the factors involved and how comebacks like these happen but I will save everyone the time and present a quick recap of what happened on the first night of the tourney. - With 1:03 left in the game Western Kentucky ties the game at 54. - New Record: Largest deficit overcome during the NCAA tournament in the last 5 minutes. - Western Kentucky closed out the game on 22-5 run winning the game 59-58. - BYU takes lead (71-70) with 2:28 left in the game. - BYU gets the win after outscoring the Gaels 54-17 in the last 25 minutes. -New Record: Largest deficit ever overcome in an NCAA tournament game. The action last night was unbelievable and it makes me even more excited for the first round to officially get under way tomorrow. Never thought I would say this but lets hope the first round games live up to hype generated by the 2 games played last night. If you call yourself a basketball fan and your bouncing off the walls with anticipation... check your pulse. Get your partner and Dosado because its time to start dancin'.